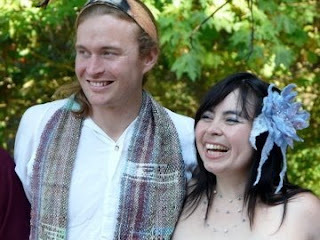 We would like to share with you some photo's from the wedding, courtesy of Yaz! People were gathering by 7:30am. You can see the sun rising in behind the garage. 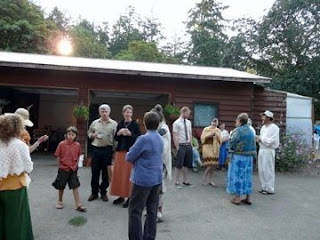 Then we all walked up through the back of the farm to the field where we all gathered in a circle. I am actually very uncomfortable with public speaking, and also can get very teary eyed very easily, but I managed to make it through the ceremony, thanks to Ryan being there. 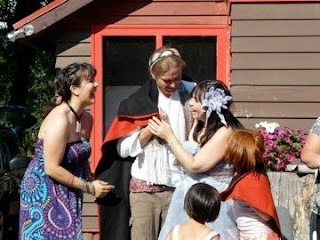 Mahshed, friend and felting instructor made my nuno-felted wedding dress. We used hand-dyed merino that Ryan and I dyed, and some organza . The dress is beaded with fresh water pearls and Swarovski crystals. The jewelery was made by Ulla Adams, Crystal Lagoon Jewelry. She used the same pearls and crystals to make a beautiful floating necklace, bracelet and earrings. 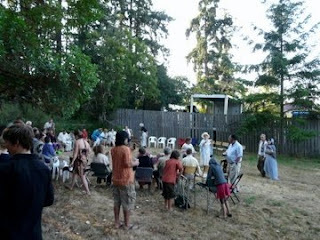 We brought one of the Saori looms and a bunch of Ryan's handspun for people to weave whilst at the reception. 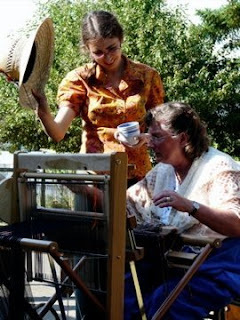 Quite a few new people wove as well as the experienced! Yaz has been learning how to make a button blanket and presented us with her first blanket which we were very honored to b e wrapped in. There are a tonne of more photo's, i.e. the lovely cake Sandra made for us etc., which I will post as an album the website once I have gathered from various folks. Thank you everyone who helped make it a special day and thank you to those of you who were there in spirit. We are truly blessed. I wish you all the happyness in the world. Be good to each other and never, never take each other for granted. you look so lovely and happy ,i got all teared up. Wishing the two of you many years of love, joy, good health and many adventures together! Congratulations! I am so happy for you two! 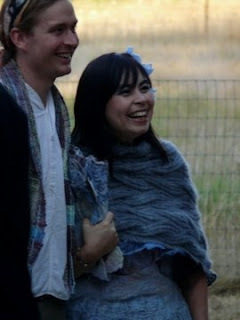 I love that your ceremony was so hand made and heart made! I wish you many many years of love. Oh so beautiful and thoughtful - how fitting for both of you! All the very best! Congratulations you guys! I hope you have a chance to display the dress in the store! It sounds like a beautiful piece! Congratulations! It sounds like it was a wonderful day! Best wishes for an equally wonderful life together. Your dress is simply amazing! I love it! A Beautiful day and what meaning the layers and layers have. Thanks for the pictures for the vicarious view is just wonderful. As you come down from the mountaintop and into the everyday, may that sustain and keep you nested in each other's minds. Blessings.